We’re in 2018, which means making music doesn’t have to be an expensive proposition. There are so many fantastic ways to produce music on a shoestring with the only prerequisite being a capable computer. We’ll examine some of the top free DAWs so you can be preoccupied with your craft and not your wallet. One of the most popular open source programs for many years running has been Audacity. Currently on version 2.2.2 as of February 2018, Audacity is compatible with Windows, OS X, and Linux operating systems, ensuring access for all users. If multitrack recording and editing seems like it’s for you, try it out with Audacity before dropping the dough on expensive software. As far as free DAWs go, PT First also includes 20 plugins/effects and the powerful virtual instrument, Xpand!2. Most importantly, you’ll have everything you need to track, edit, and mix using Avid’s industry-leading technology. Steinberg’s powerful Cubase Pro software is currently in version 9.5 with a price tag of over $500. That’s certainly not chump change, but luckily, much like Pro Tools First, LE is a free “lite” version of Cubase Pro. Cubase LE supports up to 24 MIDI tracks, 16 audio tracks, and 8 physical inputs with recording quality up to 24-bit/192 kHz. The free software also comes with the HALion Sonic SE 2 virtual instrument featuring 180 presets, so you can dive headfirst into producing music. Another 18 basic plugins, like EQ, compression, and delay, ensure you’ll have everything you need out the gate. In early April 2018, BandLab announced that it would be relaunching Cakewalk’s famous SONAR Platinum DAW as a free download. The revived DAW includes all core premium features of SONAR Platinum such as the award-winning Skylight user interface, flexible ProChannel modules, and powerful end-to-end 64-bit mix engine. The software is currently available for Windows users at no cost, making it one of the best free DAWs at around a $600 value. Despite it’s restrictive operating system requirements, you simply won’t find a premium DAW like this for free elsewhere. As of May 2018, Studio One made the leap from version 3 to 4. PreSonus’s professional software has been a widely-used DAW for many years, and Studio One 4 comes with some major upgrades to improve workflow and efficiency. Of course, none of this is without a hefty fee. Though it hasn’t yet been released, PreSonus is developing a free version of Studio One 4 called Prime. You can expect it to behave similarly to Cubase LE or Pro Tools First as a toned down, but highly functional, silhouette of its big brother. If you can’t wait for the full free release, PreSonus also offers the Studio One Professional Demo for 30 days at no cost. Keep your eyes peeled for Prime’s availability in the coming weeks. Ableton Live is one of the most popular DAWs for MIDI sequencing, sampling, and electronic music production, though it’s fully capable of audio recording and editing as well. 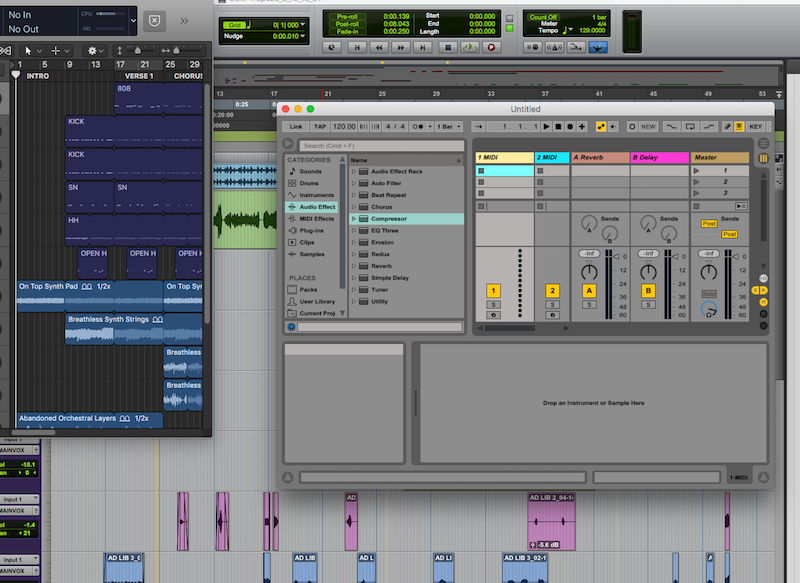 In Live 9 Lite, you can see what the Ableton workflow is all about at no charge. As we’ve seen with previous “lite” softwares, this DAW contains select virtual instruments and effects so you can get the job done on a budget. Live 9 Lite is packed with an EQ, compressor, delay, reverb, and analogue filter emulator amongst other plugins. It’s also packaged with three Ableton virtual instruments: Drum Rack, Impulse (a drum sampler), and Simpler (a powerful sampling instrument). Stagelight is a cross-platform app for music production. It’s accessibility is unrivaled, with versions available on Android, iOS, Windows, Mac, and Chromebook. That means that whether you’re on mobile, Mac/PC, or both, you can take your favorite DAW with you. Stagelight especially appeals to hip hop and EDM producers with its included drum sequencer and samples. Price ranges from free to $149 for the most complete version, so it isn’t cost prohibitive either! Cakewalk by BandLab is undoubtedly the most powerful of the free DAWs available, though it’s Windows-only. It’s a rebranded version of SONAR Platinum, minus the full $600 price tag, with all its professional features. Garageband, Pro Tools First, Cubase LE, PreSonus Studio One Prime, and Ableton Live 9 Lite are all compact versions of their full-featured (and expensive) counterparts. They’re a great way to experiment and find a DAW that suits your workflow. For many purposes they offer a complete experience, though you may consider upgrading down the road. Audacity is a widely recognized open source program for Mac OS X, Windows, and Linux. It’s been around for years and isn’t limited to a single operating system–a fantastic place to begin. For more like this, take a look at our article on the best inexpensive DAWs on the market. Should I Be Using Sidechain Compression?